Crafted using the finest woods available on the market all of which are sustainably harvested. Panda offers luxurious wood Folding Door Systems in custom sizes up to 12 feet in height. With the Aluminum Wood Clad Folding Door System, you get the reduced maintenance of an aluminum clad finish, plus the aesthetic appeal and warmth of wood in a modern application. The thermal break technology used consists in separating the aluminum profile to reduce thermal conductivity. This is achieved by using a polyamide iso-bar, with glass fibers integrated to provide maximum strength. Windsor Windows & Doors now offers you Next Dimension Classic vinyl windows and doors for when your architectural vision requires a classic, traditional sightline. You get classic styling using the latest technology. Next Dimension Pro products are an excellent alternative to aluminum for single family homes, multi-family residences and light commercial applications. Get the beauty you’ve been searching for without sacrificing efficiency or options. Windsor’s Next Dimension Signature line lets the beauty of your home shine through. From quality materials to ease of maintenance, we’ve pulled out all the stops to ensure your complete satisfaction. Our Signature line offers many choices of shapes and sizes so you can truly customize your home. Our Oak Collection™ offers deep rich grain detailing for a stunning first impression and instant curb appeal. The entry doors in this collection have the distinctive look, texture and feel of natural Oak grain, but won't dent, ding, split, rot, or crack like real oak doors will over time. The Solare™ Acoustic Single Glazed Partition System provides an alternative to the solid wall and with the opaque LCD option, privacy. The STC wall rating of 35 the system is ideal for interior offices and commercial spaces. The Solare™ Acoustic Double Glazed Partition System provides the transparency of glass yet the acoustic rating of a solid wall and with the opaque Lunar™ Smart Glassor integral operable blind option, privacy. With an STC wall rating of 44 and a door rating of up to 41, the system is ideal for interior offices, conference rooms, meeting rooms and atriums. Optional Fire resistance rated assemblies provide up to a rating of 60 minutes. AD Systems is headquartered in Everett, Washington and provides high quality sliding doors and interior storefront assemblies for projects throughout the USA and abroad. A cost effective and architecturally pleasing solution to elevator shaft smoke protection. Unlike other products on the market, the DSI 600 elevator smoke containment system is also fire rated. The DSI 600 system carries a UL10D one hour fire protection curtain system label, UL 1784 smoke migration and S label, California State Fire Marshall listing, and ICC ESR-3322. The DSI 600 system also has OSHPD approval and has Los Angeles City Fire Department acceptance for high rise applications. Syntégra™ Door Systems’ superior variety of finish and hardware options makes them perfect for demanding cross-corridor and area separation projects. Our concealed hinges and closers and flush panic devices allow uss to create attractive, substantial doors that blend into the background when they’re not in use. In the most severe applications, CYCLE-MASTER® Tough Rubber Doors deliver unmatched durability and reliability. 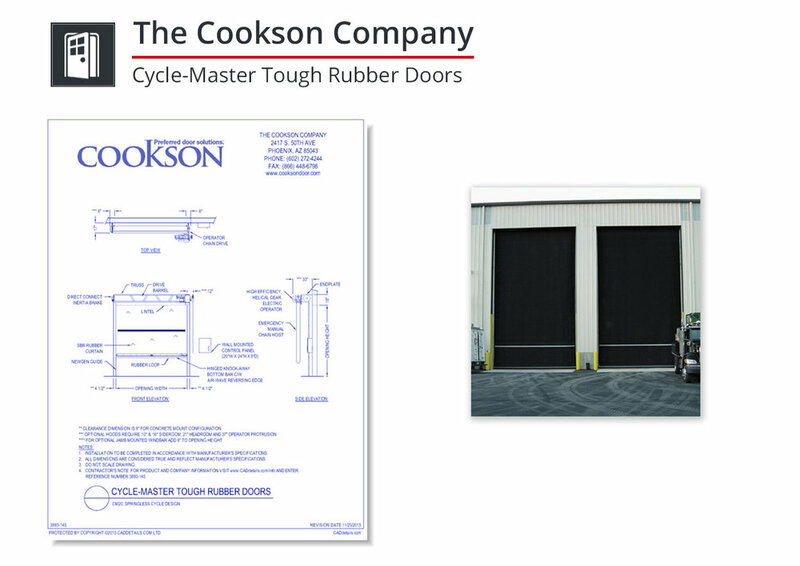 Designed for the most difficult environments, CYCLE-MASTER® Tough Rubber Doors will continue performing year after year with minimal maintenance. Consider CYCLE-MASTER® in areas that have harsh environments, windload or pressure concerns, possible door impact or high traffic conditions. In order to limit damage caused by fire, The Cookson Company, Inc. recommends that all fire doors be actuated by smoke detectors or building alarm systems. Cookson’s Auto-Test™ Fire Door Products Systems have been specifically designed for smoke detector or building alarm actuation. Looking for even more design files of doors? Browse CADdetails' CAD Drawings library, or immediately download a large selection of door design files by clicking here.